Sweden, a country of northern Europe, is very extended in latitude and therefore has different types of climates: subpolar in Lapland and the Scandinavian Mountains, Baltic semi-continental on the south-central coasts, and almost oceanic on southern coasts and islands. Compared with Norway, the Swedish climate is usually less rainy and more continental, so it is colder in winter and warmer and sunnier in summer. This happens because the westerly winds, mild and humid, are partially blocked by the Scandinavian Mountains, so they are able to easily penetrate the Swedish territory only in the southernmost part. Being partially closed and not very extended, the Baltic Sea is able to temper the climate in a limited way, especially in the north, where it narrows into the Gulf of Bothnia, which can freeze in winter. Precipitation in Sweden is generally not abundant: it is equal to or lower than 500 millimeters (20 inches) per year in Lapland (also because of the cold that lasts for many months a year), it hovers around 500/600 mm (20/23.5 in) in much of the country, while it exceeds these values in the ridge of the Scandinavian Alps, where it can even surpass 1,500 mm (60 in) per year, and along the southwestern coast, which is exposed to Atlantic currents. Winter is the season with the most noticeable contrasts between the different parts of the country, but also between different meteorological situations. In fact, when Atlantic air masses reach the country, the temperature hovers around freezing (0 °C or 32 °F) in much of the country, at least in the plains, and may even exceed this value in Stockholm and in the south, where rain can also replace the snow, but when the country is affected by Siberian air masses, the temperature drops across the country, to about -20 °C (-4 °F) in the southern regions, and as low as -40 °C (-40 °F) in the northern ones. The average winter temperatures vary greatly between the different areas, in fact, they are around 0 °C (32 °F) in January and February in the far south and around -1.5 °C (29 °F) in Stockholm, while it's around -10 °C (14 °F) in the north-central part and -15 °C (5 °F) in the far north. Consequently, winter's duration also varies depending on area, from three months in the far south to nine months in Lapland. In Sweden, as generally happens in Nordic countries, winter is also characterized by the length of the days: in December, the days are very short, and the sun doesn't even rise in the far north; February is typically colder than December, but the days begin to lengthen fairly clearly. 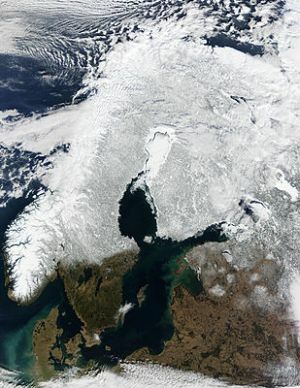 During winter, it often happens that almost all of Sweden is covered with snow, except the southern tip, i.e. the area of Gothenburg and Scania. On milder periods, when the westerlies blow, snow melts in a broader area, which often includes Stockholm, while the North remains permanently covered with snow. In the following satellite image, we can see a situation of this type, when southern Sweden is free from snow. You can also notice the frozen sea in the northernmost part of the Gulf of Bothnia (Bothnian Bay or Bottenviken in Swedish). Summer in Sweden is usually mild or pleasantly warm, and it is the season of the year with the smallest differences between north and south. In the northernmost part, north of the Arctic Circle, in the Swedish part of Lapland, the three summer months (June, July and August) are the only ones in which the temperature rises steadily above freezing; daytime temperatures are mild, around 18/21 °C (64/70 °F), and sometimes even hot, while nights remain very cool, around 10 °C (50 °F) or below. Daytime temperatures are more or less the same throughout the country, at least at sea level, while in cities located at a higher altitude, such as Kiruna (550 meters or 1,800 feet) and Östersund (350 meters or 1,100 feet), the temperatures are slightly lower. The peaks of summer heat are similar across the country as well, around 28/32 °C (82/90 °F); hot periods are typically short, and do not last more than two or three days (even though in the summer of 2018, the heat lasted for long periods). The center-north of Sweden is characterized by long, freezing winters and short, mild summers. In the northern inland areas, in the counties of Norrbotten and Västerbotten, we find the Swedish part of Lapland. Here are the average temperatures of Kiruna, located just north of the Arctic Circle, 550 meters (1,800 feet) above sea level. Here, in the worst moments of winter, the temperature can drop to -40 °C (-40 °F). In Kiruna, precipitation amounts to 520 mm (20 inches) per year, with a maximum in summer. From October to April, precipitation generally occurs in the form of snow. Here is the average precipitation. The sun in Kiruna is hardly ever seen in winter (also because it does not even rise approximately from December 11th to January 1st), while in summer, it shines for a few hours a day (however, considering that the days are very long, and the sun never sets approximately from May 28th to July 16th, the percentage is not very high). Here are the average sunshine hours per day. In the northernmost part of the coast, in Lulea, winter is still long and freezing. As mentioned, the sea in winter is often frozen, so the mitigating effect of the Gulf of Bothnia is reduced. During the most intense cold spells, the temperature from November to March can drop below -30 °C (-22). In Lulea, precipitation amounts to 510 mm (20 inches) per year, with a maximum in July and August. In the northernmost part of the Gulf of Bothnia, the sea is often frozen in winter, while it remains cold even in summer, since it reaches at most 15 °C (59 °F) in August. Here are the average sea temperatures in Lulea. In the western part of Sweden, the temperature decreases with altitude. In the Scandinavian Mountains, there are several peaks above 2,000 meters (6,500 feet) in Lapland, while in the central regions, they reach 1,800 meters (5,900 ft). The ski season is longer than in the Alps, in fact, the final races of the ski World Cup are often held in Sweden, in March (eg in Åre). Despite being a renowned ski resort, Åre is located at only 370 meters (1,200 feet) above sea level; the nearby mountains reach 1,420 meters (4,660 feet). The snowline, too, is of course lower than in the Alps because of the colder climate. In the valleys between the mountains, summer can be cool, especially near the lakes, which are frozen in winter and remain cool in summer. East of the mountain range, there is a plateau, with many cities at around 300/500 meters (1,000/1,600 feet): here, the winter is long and cold; in summer, daytime temperatures hover around 18 °C (64 °F), with cool nights, as we can see from the temperatures of Östersund, located in the central part of the country, 350 meters (1,100 feet) above sea level, near Lake Storsjön. In Östersund, precipitation amounts to 525 mm (20.5 inches) per year, with a maximum in July and August. In southern Sweden, the average temperature in January exceeds -3 °C (26.5 °F), and even in winter, there may be quite long periods during which the temperature exceeds freezing and snow melts (even though it depends on the year). Here are the average temperatures in the capital, Stockholm. In Stockholm, about 530 mm (21 in) of rain or snow fall per year, so precipitation is not abundant, although it is well distributed over the months, and experiences a minimum in spring and a maximum in summer, as often happens in the rest of Sweden. Here is the average precipitation. Here are the average daily sunshine hours in Stockholm, where the day lasts just over 6 hours in the winter solstice (December 22) and just over 18 hours and a half in the summer solstice (June 21). The sea temperature in Stockholm, on the south-east coast, is close to freezing for a few months, while it reaches 17 °C (63 °F) in August. In the Baltic Sea south of Stockholm, the island of Gotland has a relatively mild micro-climate: it has an average winter temperature just below freezing, and is also less rainy and windy that the southern part of the mainland. Owing to the prevalence of the westerlies, in the coastline facing south-west and overlooking the straits of Skagerrak and Kattegat (see Gothenburg), the climate is often rainy, cloudy and windy. However, in winter, there are periods with snow and frost here as well, when the wind blows from the east. Here are the average temperatures in Gothenburg. Since this coast is directly exposed to the west winds, precipitation is more abundant than on the other coastal areas of Sweden. In Gothenburg, it amounts to 760 mm (30 in), with a maximum in summer and autumn. Here is the average precipitation. The sun in Gothenburg rarely shines in winter, while in summer, thanks to the length of the days, it shines for a few hours a day, though a little less than in Stockholm and on the eastern side. The sea temperature in Gothenburg is a bit higher than in Stockholm, and reaches 18 °C (64 °F) in August. In the far south, in Scania, the climate shows the influence of the ocean as well, but it is even milder: the average temperatures in January and February are just above the freezing point, while summers are relatively cool. Here too, there is often cloudiness, wind, and rain throughout the year. Here are the average temperatures of Malmö. In Malmo, 605 mm (24 in) of rain or snow fall per year, with a maximum in summer and autumn. Here is the average precipitation. The sea temperature in Malmo is similar to that of Gothenburg, and reaches 18 °C (64 °F) in August. The best time to visit Sweden is summer, from June to August. June is the month with the longest days, with the midnight sun in the north and the white nights (i.e. midnight twilight) in the south, but July is the warmest month. By mid-August, both the increase in rainfall and the decrease in temperature show how soon the summer tends to decline at these latitudes. As mentioned, the sea is a bit cold for swimming even in summer. If you want to visit Sweden in its winter appearance, remember that in February the days are longer than in December and January (when they are very short), while in March, not only the days are even longer but also the temperatures are less cold, although they are usually still below freezing, and therefore with snow on the ground, at least in the north-central part. However, the more daring traveller may search precisely this kind of atmosphere, and maybe plan a Christmas trip to Lapland, with the omnipresent darkness, lightened at times by the aurora borealis. For a ski holiday too, March is preferable to the winter months. In June, in the northernmost mountain resorts, you can even ski with the midnight sun. In winter: pack very warm clothes, especially for the interior and the north: a fleece, a down jacket, a hat, gloves, a scarf; for Stockholm and the south, you can add a raincoat or umbrella. In summer: pack spring/autumn clothes, being ready to add or remove the outer layer, T-shirts, but also long pants, a jacket, a sweatshirt or sweater; a raincoat or umbrella. Warmer clothes for the mountains.